That's Cali doing her thing. 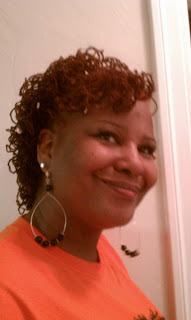 She did many new styles and cuts that day, sending Sisterlocked Sisters home Bold and Beautiful! I love short hair for the summer. Compare the pictue below with the new cut above. More volume and height. It was great to catch up with you yesterday, Lana! It's Pat! I will definitely give you a call back on the online store … I’m very excited about it and I will want to share some details about how we plan to manage it. Well, seems that distributing business flyers may not be at the top of your husband’s list! Your idea to help him out with a web site for his birthday was genuinely thoughtful (He better appreciate you!). When I thought about our conversation later, it occurred to me that your husband is just the person who should have a site that will help market his business without him going door-to-door. The holidays are coming when everybody wants to get the house ready for company and a site that is optimized for search engines can help with holiday promotions and even offer incentives for repeat business in the new year to help create repeat customers. My ‘Sisterlocks Homecoming’ discount is still in effect - $550 for 4 pages & $125 for additional pages. Really, Lana; I hardly use the yellow pages or the newspaper any more. If I see a truck whose signage interests me while I’m out, I search for the business name if I don’t see a dot com address on the truck to check out services offered and prices – either with my phone or on my PC when I get home. It’s almost expected to have an online address if you’re in business now. As I mentioned yesterday, the 40 & under crowd are so computer savvy that you nearly don’t exist if you without a site since they do a lot of business online as well ... part of the reason for my online store! … And why ignore a good segment of the population! Anyway, just wanted to plant some ‘seeds for thought’. Give me a call, lady, if you want to talk about it more; otherwise ‘talk at you’ in September!